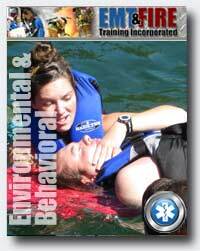 This EMT Environmental & Behavioral Emergencies CEU Course is available in two separate formats. Students may choose the Self Paced lecture or the Virtual Instructor Led Training (VILT). The Self Paced EMT Environmental & Behavioral Emergencies CE lecture may be completed on the students own schedule. Students login online, watch the lectures and then take an assessment exam over the material. Once the exam is successfully completed with a score of 80% or better, the student is automatically issued a certificate of completion. Multiple exam attempts are permited. You may apply this course to the NREMT required hours of NON-live continuing education. 1. Describe the various ways that the body loses heat. 2. Demonstrate an understanding of epinephrine and it's uses for the EMT. 4. List the signs and symptoms of exposure to heat. 5. Explain the steps in providing emergency care to a patient exposed to heat. 7. Describe the signs and symptoms and treatment options of poisoning emergencies. 8. Demonstrate an understanding of treatment options in the emergency medical care of bites and stings. 2. Discuss the general factors that may cause an alteration in apatient's behavior. 3. State the breath sounds you would hear in patient with upper respiratory swelling. 4. Discuss the characteristics of an individual's behavior whichsuggests that the patient is at risk for suicide. 5. Demonstrate knowledge of the considerations for managing overdose emergencies. 6. Demonstrate an understanding of the special circumstances that can be encountered when assessing a patient with behavioral problems. 7. Demonstrate the knowledge of the general behaviors which suggests that a patient may be at risk for violence. 8. List methods to calm behavioral emergency patients.